We normally transcribe the English word red as red. But there are two things here that worry some people. First, they argue, the initial consonant is a voiced postalveolar approximant and should therefore be written ɹ. Second, the vowel is lax (short) and should therefore be written ɛ. Let us take first the question of how to transcribe the initial consonant. It can indeed be narrowly represented as ɹ. That would be an appropriate ‘impressionistic’ transcription. This idea was put most clearly by David Abercrombie in his English Phonetic Texts (Faber, 1964), p. 17-18. He goes on to say that ŋ ʒ ɯ ʎ are less simple, because less ‘romanic’, more exotic, than the traditional letters of the alphabet. Somehow this principle of simplicity seems to have got dropped from the current IPA Handbook (CUP 1999), but I believe it is still valid. It immediately justifies the use of r rather than ɹ and e rather than ɛ for English. the vowel phoneme of get in Standard Southern British English has allophones, according to phonetic environment, which mostly lie between the cardinal vowels [e] and [ɛ], some realizations being close to one and some to the other. It is therefore permissible to choose either symbol as the one to represent the phoneme. It isn’t really phonetics, but my posting about signage (blog, 26 Sep.) has evoked a number of comments. Welsh is unusual in making use of a circumflexed w, namely ŵ, as in dŵr meaning ‘water’. (I do hope you can see it properly on your screen.) Here’s what happens if you ask for a character that isn’t in the current character set. Users of phonetic symbols in word processing or presentation software may recognize the problem. Supermarket finally decides to do something about their lack of bi-lingual signage, after 30 years of ignoring protests. 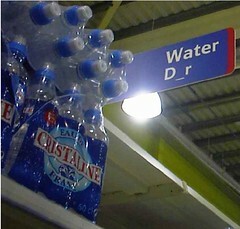 Supermarket (if you're lucky) gets a professional to translate the signs - usually only the obvious ones. No point in wasting *too* much money, is there? Supermarket's signmaking department then copies and pastes the translation from the Word doc the translator provides, into whatever programme sign makers use to composite signs, without noticing that the word dŵr - which has a circumflex over the middle vowel - has now become d_r. Nobody notices, or thinks to check the signs before hanging them up where everyone can see. 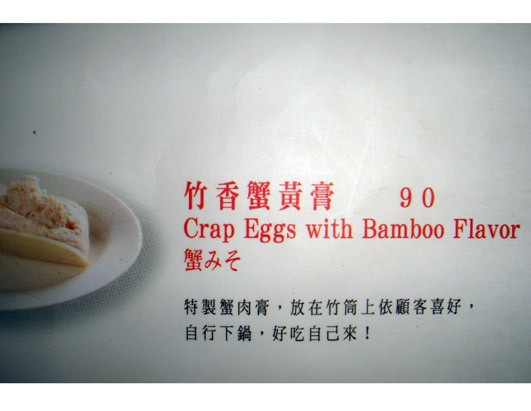 Several other correspondents mentioned the Engrish website, where we see comparable mangling of English in foreign countries. Katalin Kovats sent me this, which she found in France. But it occurs to me that with any other form of “words” I would not have used this rising tone. (By the way, it’s a mid-rise, and ends higher than a grudging low rise.) Other ways of saying ‘yes’ would have not a rising but a falling tone. Even yes in its normal pronunciation jes feels odd with this mid rise. Only jʌp or jep, final plosive unreleased, will do. or something of the sort. Ouch! At one of the conferences I attended in Poland, Siôn Rees Williams gave a talk about the consequences of the requirement that public signage in Wales should be bilingual. English-speaking companies tend to entrust the task of translation to random unqualified Welsh speakers (or worse, just use a dictionary). 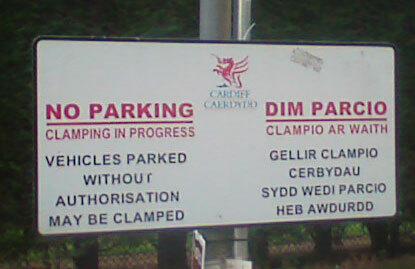 Secretaries who pass on the management’s instructions may not understand what they type when ordering new signs, and signwriters, in their turn, may not be literate in Welsh. The consequence is a rash of errors of one kind and another. Each point underlined here is an error in the Welsh. The correct translation would be as follows. So there are four errors in two short lines, and one omission of a line. Since I have friends living in Llandudno, I emailed them with a request to photograph the offending sign. It seems, though, that that particular sign is no longer to be seen. Pat Chapman was good enough to photograph for me the current one, which looks like this. My first impression was that the company that has taken over had done a better job, and that the sign might now be OK. But it isn’t. 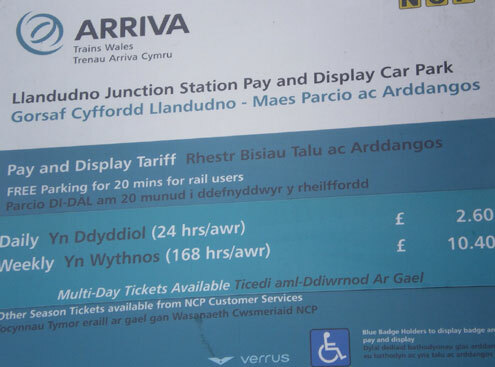 As Siôn points out to me, Maes Parcio ac Arddangos means ‘parking place and display’, so the word for ‘pay’ (talu) has disappeared: it should read Maes Parcio Talu ac Arddangos (see sidebar). In the next line, the word Bisiau (non-existent in Welsh) ought to be Brisiau ‘prices’, the soft-mutated form of prisiau. ‘Daily’ and ‘weekly’ would be better translated Y dydd and Yr wythnos. It’s not just Welsh. In Łódź last week I stayed in a French-owned hotel. 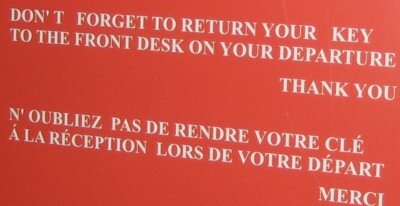 But even they didn’t get the French signage quite right. Á LA RÉCEPTION ought of course to be À LA RÉCEPTION. 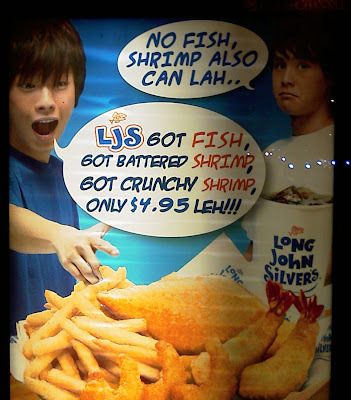 Moral: always use qualified translators when producing public signage. And check afterwards. What Tony Blair did a decade ago, the politician David Miliband is doing today, according to a feature article in yesterday’s Guardian newspaper. It is claimed that he is “dropping received pronunciation” and taking his accent down-market. According to the article, which is by the voice coach Luan de Burgh, this involves his ‘dropping the dark L’ (i.e. vocalizing it) and ‘dropping “t” from the end of words’ (i.e. glottalling it). Luan’s description of these processes is clear and accurate, except that one might quibble about the term ‘dropping’, since it is a matter of replacement rather than deletion. However at this point the article brings into play a technical term, one you’ve certainly never heard before. It is the glotteral stop — not just once (which might have been an excusable slip) but twice. Luan confirms that this embarrassing mistake, glotteral for glottal, was not his, but that of the Guardian’s subeditors, and that it will be corrected today. Someone at the Guardian ought to have a red face. I read your piece about avoiding predictable allophones in dictionary transcriptions, but it occurs to me that in the Longman Pronunciation Dictionary you do show one predictable allophone: the flapped /t/ of American English in words like pretty. This is something almost no other dictionary shows (the only other one I can think of is Websters Third New International), so I can't help but wonder why you chose to show it. Was it just because American flapping is so salient to British ears? Yes, and because the conditions for its (non-)ocurrence are rather complicated. Actually, in my view it's the phoneme d on the whole, and that's what the Oxford Dictionary of Pronunciation shows it as. But my publishers Longman thought, no doubt rightly, that it would not be acceptable to teachers of AmE to write it as d.
Er... ˈædəm is precisely how the AmE version of atom is written in ODP. My considered justification for the LPD symbol t̬ would also include the claim that it is a handy abbreviatory convention for precisely this stylistic hesitation between t (rare) and d (usual). And actually a voiced t is not necessarily identical with an ordinary d, in particular because of its short duration and in its effect on the duration and possibly the quality of the preceding vowel or diphthong. Personally, I prefer to call the process ‘tapping’ or ‘voicing’ rather than ‘flapping’, since the output of the process is phonetically a tap ɾ (quick contact up and down) rather than a flap ɽ (quick contact in the course of a foward ballistic movement). It differs from the default realization of t in both voicing and (usually) manner. Many English-speaking Poles seem to believe that comfortable is pronounced with -teɪbl at the end, just like table. Native speakers, on the other hand, know that it has a weak vowel, -təbl, like other words with the -able suffix (conceivable, perishable, preferable). This seems to be not so much a personal error of this or that EFL speaker in Poland, but an institutionalized mispronunciation passed on from teacher to learner and from one Pole to another. There are other comparable cases. I am not referring to general errors of pronunciation such as difficulties with this or that sound, but to lexically specific ones affecting particular (pɑː- ? No, pə-) words in the vocabulary. Many EFL learners seem to believe that clothes is pronounced as two syllables, ˈkləʊðɪz or the like. But native speakers pronounce it as one syllable, either kləʊðz as I say it myself (or at least that’s how I think of it) or simply kləʊz, i.e. as a homophone of close (v.), which is how Jack Windsor Lewis thinks most people say it. I am sure readers will have other examples. PS Yes! Harry Campbell mentions aɪˈdiː for idea, frequently heard from people whose first language is French. When I talk in public about pronunciation dictionaries one of the questions I am frequently asked concerns the level of phonetic detail that each dictionary entry ought to show. Why don’t we show the aspiration of the initial plosive in time taɪm, thus tʰaɪm? Why doesn’t the dictionary show the glottal stop as a possibility in right raɪt, i.e. raɪʔ? (After all, that’s how it is frequently pronounced.) Why don’t we show that the lateral in sell sel is dark, thus seɫ? (Or perhaps we ought even to write sɛ̈ɫ, showing what happens to the vowel in this environment. Not to mention such further possibilities as sɛ̈o). The usual answer is that each of these would constitute allophonic as opposed to phonemic notation. Despite the difficulties that modern linguistics has with the notion of phoneme, the point remains: the aspiration, the glottalling, and the velarization are predictable by rule. Therefore they do not need to be symbolized explicitly each time they happen. Furthermore, allophones at the edges of words typically apply only in certain environments. A glottal stop in right now raɪʔ naʊ will pass unnoticed in mainstream BrE or AmE. But in right away, thus raɪʔ əweɪ, it would convey a particular regional/social message. Different phonetic contexts demand different allophones. The lateral at the end of sell is not dark in all contexts. In a phrase such as sell it, with a vowel following, it is clear. Marking it as dark in the dictionary entry would actually be misleading. All good students of phonetics learn to recognize and perform a close back unrounded vowel, ɯ. But because it is perceived by most of them as a very strange and exotic sound they tend to overarticulate it: tense jaw muscles, tensely spread lips, extra length, grimace. Those in whose language it occurs, on the other hand, naturally treat it as a perfectly ordinary and everyday sound. They pronounce it in quite a relaxed way. As far as the languages I have come into contact with are concerned, that means speakers of Korean or of Scottish Gaelic. In both of these languages it contrasts with a close back rounded u. The Korean word for ‘writing, a piece of writing’ exemplifies this vowel: it is 글 kɯl (or you might prefer to show the initial consonant as a devoiced g̊). Of the two competing romanizations of Korean, one represents the word as geul, the other as kŭl. You usually get something similar for the close back vowel of Japanese. But that’s not so good for demonstration purposes, since Japanese has no contrast of rounding. Some time ago (blog, 28 June 2006) I mentioned the excellent treatment of Scottish Gaelic phonetics on the strangely named Akerbeltz website. In the section dealing with vowels there are copious examples of ɯ, long and short. Here in Poznań I have been teaching some elementary phonetics to an international group of students in the Interlinguistic Studies programme. When we got to vowel description, fortunately we had a Korean among us to demonstrate ɯ. It makes a difference for students to hear one of themselves pronouncing sounds perceived as difficult or exotic, rather than just the teacher. And for the student who acts as an informant it gives a kind of pride to discover that their own language contains sounds that other students find difficult to recognize and reproduce. Michael Ashby tells me that PHONLINE, a complete online distance-learning course in phonetics, which was developed and piloted at UCL in 2006, will be running again from November 2008 to February 2009. The course will be delivered by an interactive website, with course content and interactive discussions available online using an ordinary web-browser. Read more about it here. The deadline for application is 5th October 2008. Enquiries to phonline@ucl.ac.uk. I feel obliged to bring up the case of Glasgow here. Why Glasgwegian rather than *Glasgovian? (Cf French Glasvégien, Glasgovien). I am too ignorant to know, but looking in OED I see a quotation from the [Glasgow] Herald of 1923: "'Glaswegian' is both ugly and absurd... Let us in the name of etymology and common sense be Glasgovians." The first citation is from 1818 (Scott) and their etymology says that Glaswegian is on the model of Galwegian (Galloway), which is in turn on the analogy of Norway (Norroway) → Norwegian. For Galloway there is also the adjective Gallovidian from Gallovidia, "a Lat. form of Welsh Gallwyddel = Irish Gall-gaidhil, lit. 'foreign Gaels', now Galloway, a district in the SW. of Scotland (the shires of Wigton and Kircudbright)". Apparently the adjective Galwidian also applies to Galway in Ireland. Gallovidian gets 7500 Google hits, Galwidian only one. Here is an advertisement for the Maestro debit card I saw in the train on the way to Gatwick Airport. It involves a bilingual pun. Spain is a major tourist destination for English people. In Spanish the name Juan is pronounced xwan. We have no x (voiceless velar fricative) in English, so Spanish x is normally mapped onto English h.
But in England the cluster hw is no longer used in native words such as what, which, where: we simplify it to w. Hence the Spanish cluster that started out as xw ends up in English as plain w.
Spanish a sounds quite similar to English ʌ. 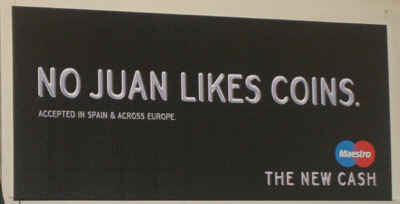 So Spanish Juan xwan can be identified with English one wʌn. “No one likes coins.” That’s what the advertisement claims, anyhow. Sorry, I know jokes aren’t funny if you have to explain them. A woman gave birth to identical twins, but unfortunately she and her husband couldn't afford to keep them, and gave the boys up for adoption. On the boys' second birthday, the couple received photos of the two children, one of which had been adopted by a Mexican family and one by an Indian family. After showing her husband the photo of their biological son Juan, she asked if he'd like to see the second picture. "Nah," he replied, "If you've seen Juan, you've seen Amal."